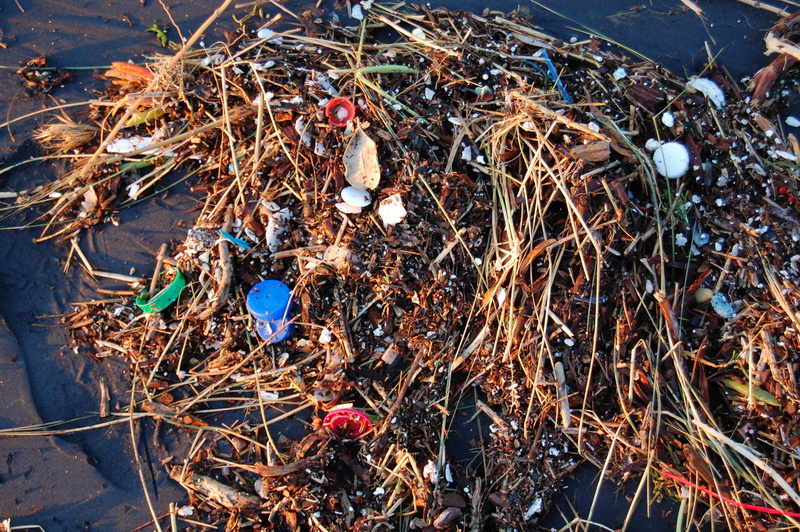 Plastic trash litters our coastlines and waterways, posing risks to wildlife and humans. We’ve all heard the stories and seen the pictures of giant mats of plastic trash floating in our oceans. But it’s not just an issue in faraway oceans on the other side of the globe. Plastic trash litters our own coasts and beaches, floats down our rivers and streams, collects along our roads, and travels with the wind, creating an eyesore and hazards for birds, fish and other marine life. Making matters worse, tossed by the water and degraded by the sun, these plastic pieces break down into tiny fragments, or “microplastics,” small plastic pieces less than five millimeters long (about the size of a sesame seed) that can be harmful to our ocean and aquatic life. Microplastics threaten marine animals because the animals can easily mistake these tiny pieces as food. The harmful toxins that adhere themselves to plastic make these tiny bits even more dangerous. What’s more, these toxins and plastics can even enter the human food web through fish and shellfish tissue. Save The Bay is playing a leadership role in establishing baseline data and understand local impacts of this microplastics problem in our tidal rivers and the larger Bay. Our goal is to highlight the local problem of microplastics and tie it into regional campaigns to eliminate single-use plastic, such as bags and straws, and Save The Bay’s own Litter Free Pledge campaign. The Manta Trawl allows Save The Bay’s Waterkeepers to collect microplastics from surface water in Narragansett Bay. Microplastics are much too small to be seen on the water, so we applied for and received funding through the Taunton River Wild and Scenic Stewardship Council to purchase a Manta trawl, designed specifically to collect floatable debris off the surface of the water, and conduct microplastic sampling trawls within Mount Hope Bay and the Taunton River. The Manta trawl is a unique piece of equipment because of its ability to float at the surface of the water and take surface samples. The trawl’s wide rectangular mouth funnels floating debris down a trailing cone-shaped mesh net into a detachable capped terminus called a “cod end.” The net’s tiny .33 mm mesh allows us to collect the smallest of specimens. 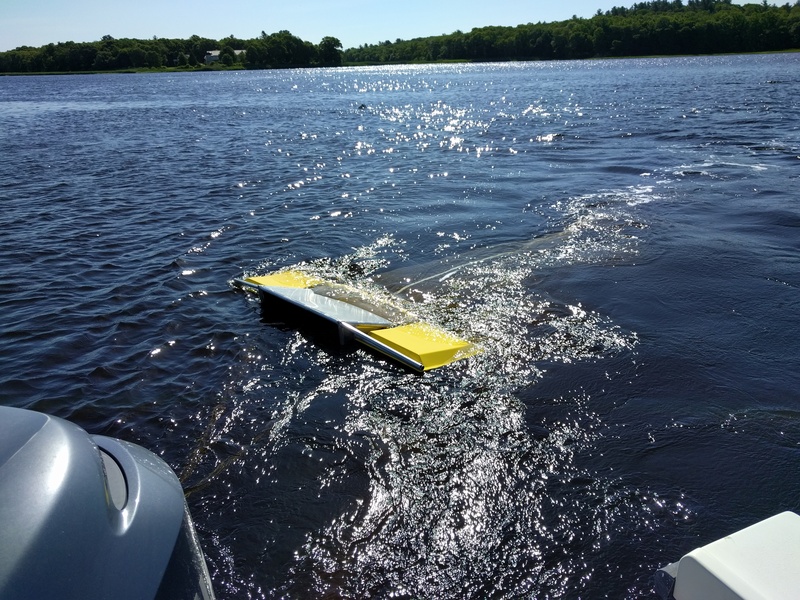 This summer, Save The Bay Waterkeepers Dave Prescott, Mike Jarbeau, and Kate McPherson set out in mid-June to sample the surface waters of the lower Taunton River for microplastic debris. Why the Taunton? Because the cities of Taunton and Fall River together have 20 combined sewer overflow outfalls; if their combined sewers overflow, larger plastic waste spills into the river and adds to the microplastics problem in our waters. Coastkeeper David Prescott sorts microplastics collected in the Manta trawl. 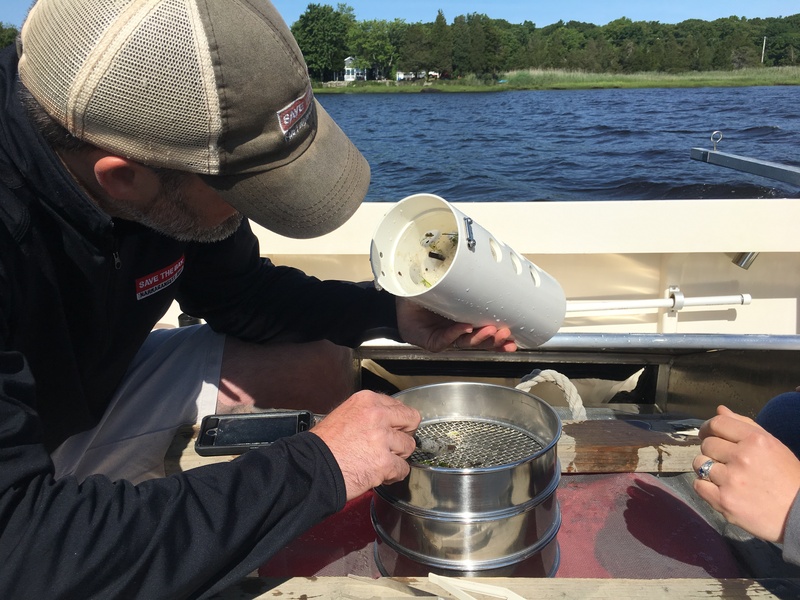 On this particular day in June, the Waterkeepers sampled five trawl locations, starting at the Taunton Yacht Club in the north and ending near Battleship Cove in Fall River, Mass., before the brisk wind and choppy water ended their efforts. At each sampling site, they launched the Manta trawl from the side of the boat and secured it there so that the trawl was undisturbed by the boat’s wake when towing. This ensures a representative sample of the plastic and other materials floating on the water’s surface. 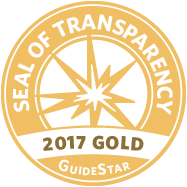 The trawl moved alongside the boat at about two miles per hour for 20 minutes, recording wind speed, boat speed, date, start time and end time, and GPS coordinates at the start and end of each trawl. At the end of the trawl, the Waterkeepers pulled the equipment from the water and sprayed down the net mesh to ensure all debris particles collected at the cod end. They washed the sample through a stack of sieves that sorted the particles by size, and then separated the microplastics by hand, preserving the samples in an alcohol solution and labeling them for future analysis. Sadly, but not surprisingly, the trawl found microplastics in every sample collected. Generally, upriver samples contained fewer plastic pieces, while the southernmost trawl at Battleship Cove, collected the most plastic, including some larger pieces of Styrofoam. They also captured natural floating debris and aquatic life, including pieces of plant materials, zooplankton, small fish and algae. Hand-picking out the tiny pieces of plastic from among the marine life in rough bay conditions was truly an exercise of balance, coordination and steady hands. These samples will be compared to samples collected in other locations around the Bay over time. The Save The Bay Waterkeepers hope to revisit trawl sites during varying weather conditions to compare the amount of plastics in the water before and after storms, to get a better understanding of the primary sources of microplastic pollution. They’ll share the results with the public and with public officials to help generate more discussion about the dangers of plastics and the role we all play in keeping our watershed healthy. As always, this new microplastic monitoring effort will combine with ongoing water quality monitoring and outreach efforts with on-the-ground beach cleanups as part of Save The Bay’s beach cleanup program and water quality advocacy efforts.